In 2015, female country artists are stymied by the radio industrial complex at a stunning rate. Why is the genre so bro-centric? And can it ever change? Monroe’s distinction sounds especially wry in light of a conversation that took place last month between a radio consultant named Keith Hill and a trade publication called Country Aircheck. Buried between routine comments about the value of software in keeping one’s music library organized and a taxonomy of Hill’s personal “sound codes” (“no-to-low twang, medium twang, and high twang”) was the observation that part of running a successful country station is keeping the ratio of female performers to male performers low. It’s a good line, piquant and indelible — the kind of thing you might hear in a country song. Both lettuce and tomatoes responded swiftly. “I have now received death threats,” Hill told The Tennessean a few days later, adding that he was a marketer, not a social engineer, and tended to prefer ballads anyway. That Country Aircheck had produced a robust six-page special on the subject of women in the business of country music just a few months earlier suddenly didn’t matter. Controversy is more flammable than research, flinging more marketable than seeking. One of the stranger omissions from the media’s version of the conversation — predictably reduced to Men vs. Women — was the matter of content. It’s true that in 2014, women voiced only 18 percent of country’s top 100 songs, down from 38 percent in 1998. It’s also true that the gap between men and women at the top of the country format is second only to rock. But the size of the piece doesn’t say anything about the flavor of the pie. For the past few years, country music has been dominated by a soft, modern version of party music whose most successful artists — Luke Bryan, Florida Georgia Line, Jason Aldean — tend to sing about hanging out and/or drinking, unbridled by the responsibilities of family and work. If you squint, its anthems sound like pop or hip-hop, slowed by the occasional ballad whose vague passion seems borrowed from grunge, or at least grunge as brushed clean by Nickelback and Creed — bands whose styles have deeper roots in the triumph of Christian rock than the self-immolation of punk. 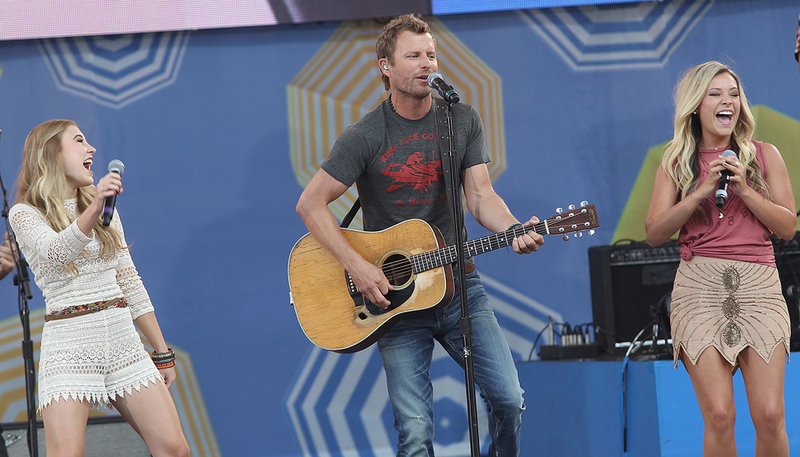 Bennett Raglin/WireImage Maddie & Tae perform with Dierks Bentley on ‘Good Morning America’ in June. And though these singers are men, they seem younger all the time. The notion of “the boys” — as in “I know how you get when you go out with those boys” — has been rendered literal: Cowboy hats have been replaced by baseball caps, boot-cut Wranglers replaced by the baroque stitching of True Religion jeans. Less and less will commercial country tell you about the joys of raising children or making a marriage work. Instead, it instructs you to play flip cup and enjoy the universal pleasures of chillin’. Whether these artists are trying to cross over into wider markets or court listeners away from them is hard to tell. At times it seems like some of this music succeeds in part because its fans are spooked by the prospect of listening to actual rap. In any case, it is very different terrain from 1998: The sound is more commercially flexible, the image a lot younger. To say there are fewer women succeeding in commercial country now than there were then presumes they are working on the same terrain, and is as hypothetical as saying that fish would make great painters if only they had hands. Which brings us to the question of radio, which for most people is still a literal black box. Kristina Carlyle, program director at KTGX in Tulsa, describes the current moment as a catch-22. “Our experience in the past is that women don’t like women” — shorthand for the dictum that women, a majority of country-radio listeners, tend to prefer listening to music by men. “But we’ve gotten so into that groove that we don’t let female songs through because we think that’s how it is.” What might’ve once been good reasoning has lapsed into a parental because-I-said-so. One of the more interesting figures from Country Aircheck’s report was that in 2012, 214 singles were released to country radio, with 61 voiced by women, or 29 percent overall. In 2014, the percentage was basically the same — 28 percent — but the pool of songs had shrunk by 25 percent. It isn’t just women who have less of a chance succeeding on country radio now: It’s everyone. And then there’s Maddie & Tae, who hit no. 1 last July with “Girl in a Country Song,” whose lyrics poked a sly and good-natured kind of fun at the clichés of male country without getting too impolitic. Occasionally, the machine hiccups. KTGX’s Carlyle mentions the case of Cam, a singer whose debut EP, Cam Country, pushes no particular boundaries but has a strong spirit: It’s rootsy but polished, a little rough without making roughness a talking point. “One weird, unwritten rule is that people don’t like to hear ballads in the summer,” Carlyle says. “They put four up-tempo [Cam] songs at us through iHeart, but the most compelling song she had was this ballad called ‘Burning House.’”3 When Cam visited The Bobby Bones Show (with 3 million weekly listeners) earlier this month, Bones requested that she play part of “Burning House” on-air, which was followed by the recording later in the show. It hadn’t been intended as a single but began selling wildly, and radio brought it into the fold. Conventional logic proved tired, and the tail wagged the dog. But in general, the attitude about these issues is deep and institutionalized. At one point in our conversation, Carlyle says her work computer actually warns her when she schedules back-to-back songs sung by women. “You’re supposed to separate ballads, and I’ve always agreed with that,” she says. But the woman rule is harder to understand. “One might be up-tempo and one might be down-tempo,” she says. Content is suddenly immaterial: Fast or slow, a woman is a woman. 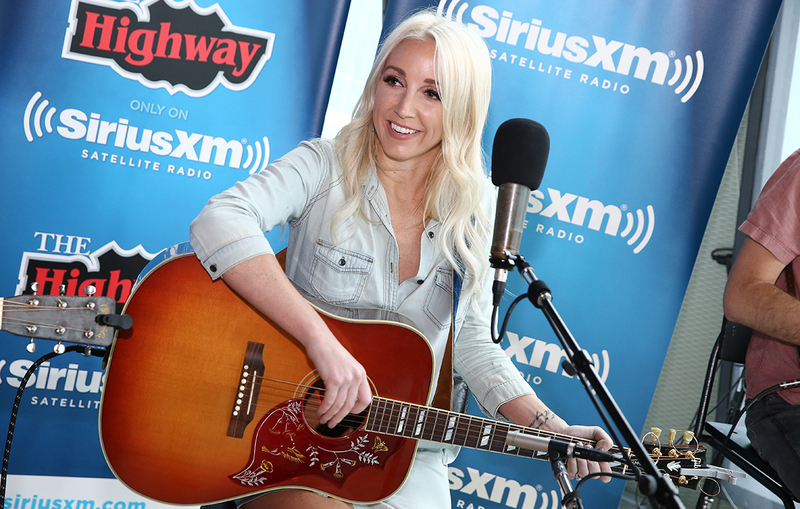 Terry Wyatt/Getty Images Ashley Monroe visits ‘Mornings With Storme Warren’ on SiriusXM’s The Highway channel. Both Musgraves and Monroe have albums out this summer. Musgraves’s, out now, is called Pageant Material. As an artist, she is often cast — and casts herself — as an easygoing kind of outlaw, the product of country culture but a realer and bygone version of it. Her previous album, Same Trailer Different Park, performed middlingly by Nashville standards but won two Grammys and vaulted her into the strange martyrdom of saving a genre from which she appeared to be trying to break away. Pageant Material, though, was heralded with a cover story in the slick and progressive-leaning music magazine The Fader and an in-store performance at a record store in Williamsburg, Brooklyn — places friendly to country music for people who don’t like country music. Monroe’s The Blade, which comes out July 24, is a brighter, more exploratory album than Like a Rose, but no less obvious a fit. Its first single, “On to Something Good,” has the neutral, healthy feel of a lotion ad, while its best songs — namely “The Blade” — are still like the best songs on Like a Rose: bittersweet, understated, a firm oar stuck in deep water. When I ask why Monroe bothered touring radio stations when Like a Rose hadn’t fared well there, she offers the boilerplate explanation that radio helps music reach millions of people. But the trip seems to have inspired a certain reticence. During the course of our short conversation, she mentions a flurry of artists with whom she feels she truly belongs, including Chris Stapleton, Sturgill Simpson, and Musgraves — artists who posit themselves as honoring country by bucking its conventions. In this world, to be commercially misunderstood is a badge of honor — it tells you you’re skirting the fences of a pasture that has grown too small to roam. Traditionalism is often cast as the antidote to the poison of the present, especially in country music, where humility bears out over glitz, where all roads lead home to the porch rocker, where simplicity is king and the relieving arms of God are ever-present whether invoked as such or not. Now will always be a time of sin and unnecessary complexity compared to the roseate past. So when Monroe says she’s too country for country radio, she’s playing into the sturdy old notion that those who carry the flame often do so quietly and without thanks, guided not by spoils of the present but a higher ideal. Beyond being women, Monroe and Musgraves seem to have little in common with the Maddie & Taes and Kelsea Ballerinis of the world, which stands to reason: Just as female country artists in 2015 aren’t the same as those from the late 1990s, female country artists of 2015 aren’t the same as each other. They are playing different games with different ends. The irony of recent public conversations on the subject — a subject that comes up with sad, cyclic regularity — is that they’re had in the name of solidarity but end up reducing their subjects to an abstraction: woman with boots and guitar. Alli Harvey/WireImage Kacey Musgraves performs at Stagecoach in April. Part of what makes following the commercial side of country interesting is that its boundaries are clear and its business so tightly controlled that innovation — and transgression — is obvious. Like Hollywood, it’s a world of rules and formulae in which change is slow and creative spark is refined by the gantlets of market testing and image consultancy. Anything that breaks its surface has already burrowed such a long way that to emerge with any wit and spirit intact is miraculous — a bright red tomato on a deep green vine. In 1947, the singer Red Foley released a spirited piece of music called “Never Trust a Woman.” “She’ll go through all the pockets in your pants,” Foley sings. “And if you object, there’ll be a big fight / And chances are it will last all night.” Other hazards include being driven to drink, being poisoned by gossip, and being hit on the head with a rolling pin. Jenny Lou Carson is the writer of ‘Never Trust a Woman.’ Red Foley, who does the tune on Decca, is not the writer, even if the Decca label credits Foley with the penning. Because why would a woman write such a song unless she felt like she had to appeal to the worst in men in order to sell it? Mike Powell (@sternlunch) is a writer living in Tucson, Arizona. The biggest exception here is Little Big Town, a female-fronted band that puts party themes to good work while making light fun of them at the same time. See: “Pontoon,” a song that maps the masculine fantasy of joyriding in one’s Ford onto a very slow-moving boat. Wilson’s own station is part of a small, Akron-area company called Rubber City Radio. KTGX is an iHeartMedia station. Womack’s 2014 album, The Way I’m Livin’, was released on Sugar Hill Records — her first outside the Nashville system.